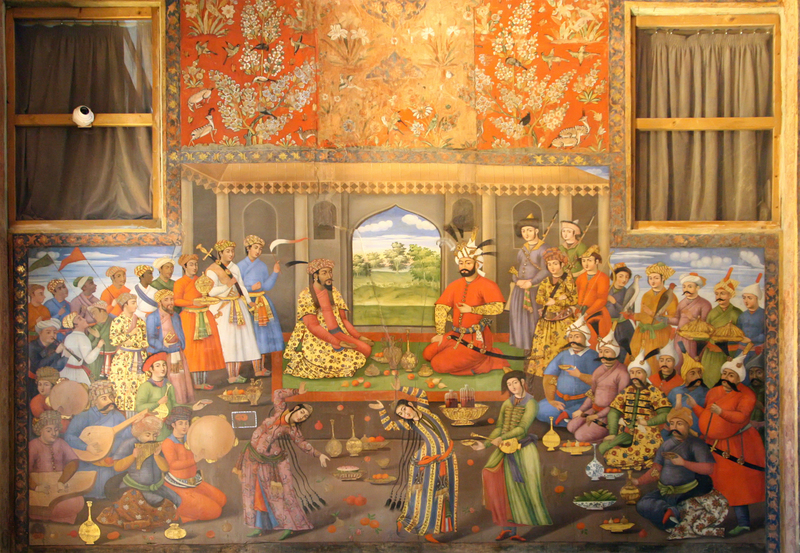 Nowruz is among the most ancient and significant astrologically based holy days celebration in the world. 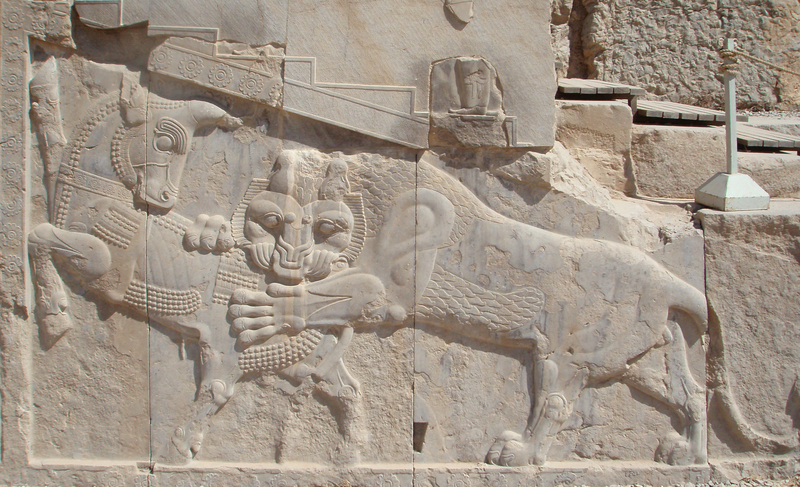 It began with Mithraism and Zoroastrianism and is still celebrated with zeal in several countries from Azerbaijan, Russia, Syria, Turkey , India and of course Iran. A repeating theme is the allegory of the balance of light and darkness illustrated by the bas-relief shown above. This is echoed in the celebration of Ostera or Easter which falls on the first Sunday after the first full Moon in Spring. It represents earthly fertility in the waxing day force as well as spiritual resurrection. What is above, is below. This applies to the nation more specifically than to the individual. Jupiter in Leo, the domicile of the Sun occupies the Tenth House and is indicative of rulers, Although he enjoys some elemental sympathy from the Common People, we can say Jupiter is inflated and worst of all retrograde, symbolically moving away from the “throne.” The sympathy is amplified by the Sun in the Sixth House.This denotes the fall of a leader, Considering the pomp and circumstance of Leo, this may very well refer to a prominent member of the aristocracy or Royal Family. The video below shows the progress and visibility of the eclipse. Eclipses affect most those nations and cities that fall under the sign of the eclipse as well as where it is visible. This would include Egypt, Normandy, North Africa, Portugal and Scandinavia. My primary focus is on the United Kingdom and those places in the same time zone and visibility of the eclipse although much of what I have to say would apply in a lesser extent to Europe, Western Russia and the Piscean nation of Egypt, the latter of course in a very volatile state. 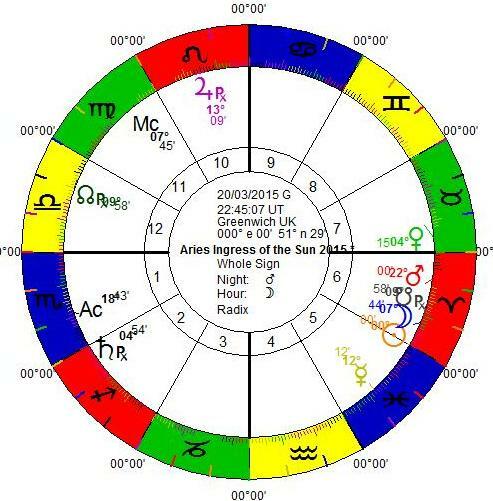 The time if the eclipse at GMT falls ominously in the 10th House. 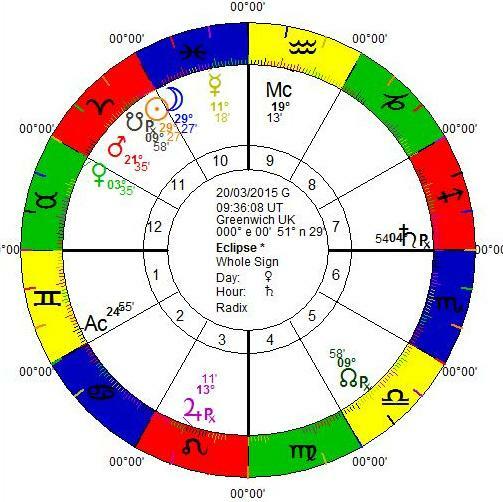 It`s almost as if the eclipse sets the stage for the fall of the *monarch* Jupiterean Pisces turns off the lights while Saturn holds the Seventh House. It isn’t hard to read this fairly literally. We could say that the strong Mars in the Eleventh House lends support to the Tenth, but with the S, Node and really no mitigating elements, it might very well do more harm than good. The significance of an Eclipse is in the larger picture of the nation or nations rather than on the lives of individuals specifically, but of course whatever affects the nation will affect the people, sometimes in major ways and more often in ways that are not immediately detected. If you celebrate only one or two things a year, the Vernal Equinox is highly significant – the forces of darkness and light are balanced with the forces of light, with the Sun waxing in the Sign of his exaltation. This entry was posted in Iran, Islam, Lord of Year, Persia, Traditional Astrology, Venus.